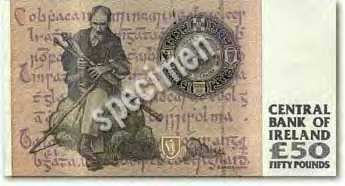 By February, 2002 the Irish Punt was discontinued and replaced with the European currency called the Euro. The banknotes shown below have now passed into history. If you have saved any of them, you might want to hold them as a keepsake. The banknotes were put into circulation from 1992 to 1996. 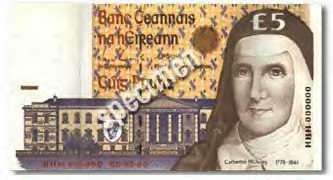 They are the last banknotes with Irish historical figures that will ever be released. £5 Catherine McAuley (1778-1841), foundress of the Sisters of Mercy. 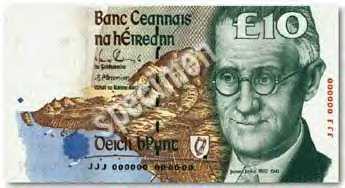 £10 James Joyce (1882 - 1941), poet, author of Ulysses, Finnegan's wake. 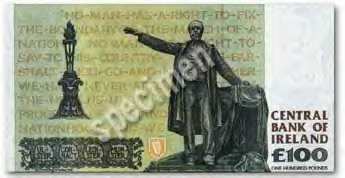 £20 Daniel O'Connell (1775-1847), the liberator, mayor of Dublin. 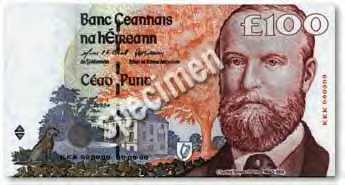 £50 Douglas Hyde (1860-1949), first President of Ireland. £100 Charles Stewart Parnell (1846 - 1891), author of 1886 declaration. These banknotes were designed by Robert Ballagh, one of Ireland's foremost artists, whose work has received international acclaim. 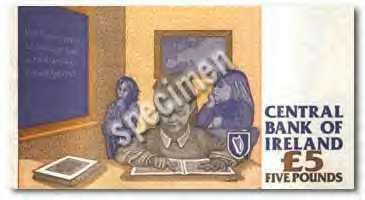 The Central Bank of Ireland introduced them from 1992 to 1996. This was because the old Irish notes were too easy to forge and they were large and inconvenient. The theme of the series is centered on the 19th and early 20th centuries - the era in which modern Ireland was formed. Catherine McAuley ata ar aghaidh an nota. This side depicts Mother Catherine McAuley foundress of the Sisters of Mercy. My wife was a member of her religious community until 1980 in Dallas, Pennsylvania. Dan ata ar dhroim an nota. James Joyce ar aghaidh an nota. 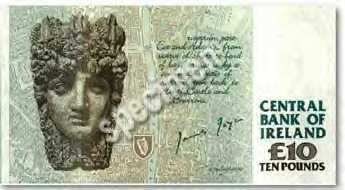 The front of the £10 note features James Joyce, the Irish poet. Behind him is view of Dublin city. I cannot myself distinguish the view in the rear. Finnegan's Wake ar dhroim an nota. "Riverrun past Eve and Adam, from swerve of shore to bend of bay, brings us by a commodius vicus of recirculation back to Howth Castle and Environs." Daniel O'Connell ar aghaidh an nota. 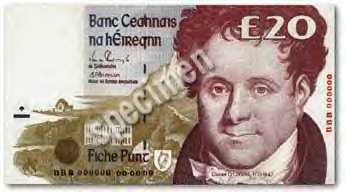 The front of the £20 note carries a portrait of Daniel O'Connell based on a mezzotint by John Gubbins which is held in the National Gallery of Ireland. The portrait is set against a contemporary landscape drawing of Derrynane Abbey, Co. Kerry, the original of which is held by the National Library. Pledge of 1845 ar dhroim an nota. 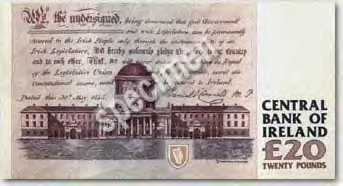 The back of the note bears a pledge signed in 1845 by O'Connell and others and now held in the National Gallery of Ireland. In the foreground is a drawing of the Four Courts, the original of which is held by the National Library. Douglas Hyde ar aghaidh an nota. The front of the £50 note features a portrait of Douglas Hyde (1860-1949), first President of Ireland, by Robert Ballagh. 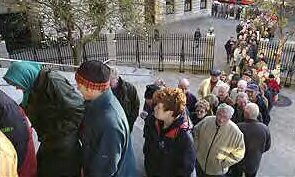 In the background is a drawing of Áras an Uachtaráin which is set against a design from the interior of the base of the Ardagh Chalice. Piobaire (a piper) ar dhroim an nota. note features a piper and the crest of Conradh na Gaeilge overlaid on a 16th century manuscript from the collection of the Royal Irish Academy. Charles Stewart Parnell ar aghaidh an nota. In the background is a view of Avondale House and gardens, Rathdrum, County Wicklow, the home of Parnell. A hound appears in the foreground. Parnell monument ar dhroim an nota. This is the Parnell monument located in O'Connell Street, Dublin. It includes the statue, the torch, and metal work bearing the names of the four provinces. These are set against a background of a section of the declaration made by Parnell in 1886 in response to the introduction of the proposed Home Rule Bill and which also appears on the monument. Irish Punts bailed for destruction.